Wishing you all a Happy and Colourful New Year 2018!!! 2017 was a fruitful year for me in both my personnal and professional life. 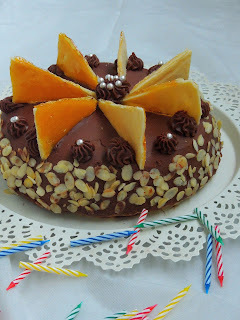 You might have noticed that am very much slow in posting though i dont forget to blog atleast thrice a week. Healthwise, i undergone an operation for my sinus problem and now doing much better. However this year brought me few changes in myself. Yes i seriously took much attention towards my health and am taking regular medication for spring allergy for which i never took specific attention apart from taking usual anti allergic medicines. 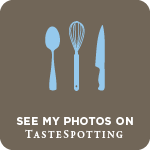 Because of my super duper busy professional life, i couldnt participate in any food events or any other cookery contests.I have posted 166 posts during this year, i cant believe that i have published this much posts. Now my space have 3514 posts totally. Actually this blog was started initially to kill my leisure time, however professional life is keeping me super busy but still i dont forget to blog. April : A-Z Baking Around the World with 26 days of different baked goodies from various cuisines of the World. September - Protein Rich Dishes with 26 days of Protein rich dishes. 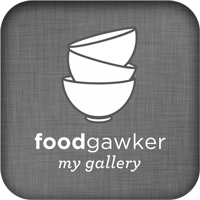 Let's take a glimpse of my top recipes with highest views during this whole year. This year's cooking resolution is going to be Eat Healthy and Fit. Sending this post to Srivalli's Best of Year 2017. Sattu ka Paratha or Sattu Paratha is one of the most popular Indian breads in Bihar region of India. This Sattu paratha is a staple food of Biharis. Sattu is Roasted channa dal flour, and its one the execellent protein source for vegetarians of Bihar. Obviously this sattu is used in many authentic Bihari recipes. 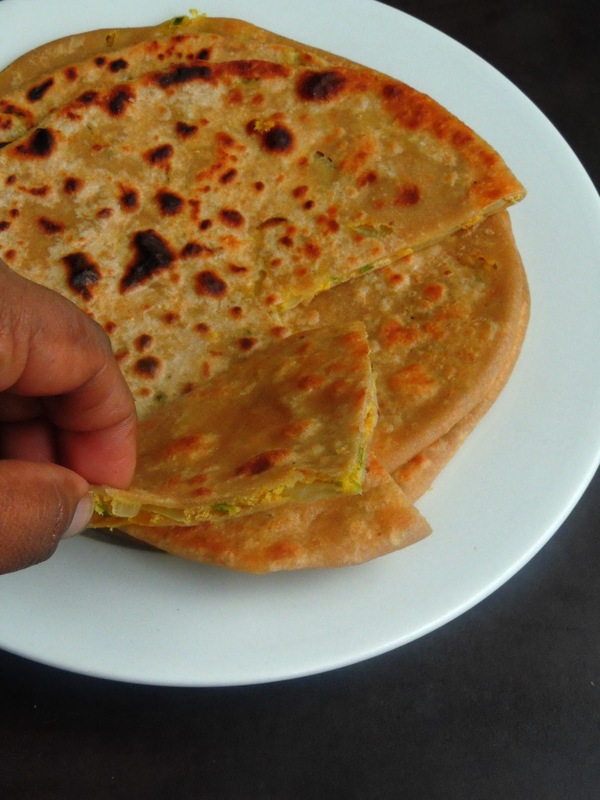 The most known dish cooked with sattu is this stuffed paratha. Not to forget that this roasted channa dal flour is full of fibre with many nutritious values in it. Its a super healthy alternative for many in Bihar as its available very much cheap there. South Indians makes excellent chutneys with roasted grams but in Bihar, they makes healthy sattu paratha with the same roasted grams aka pottukadalai (in tamil). 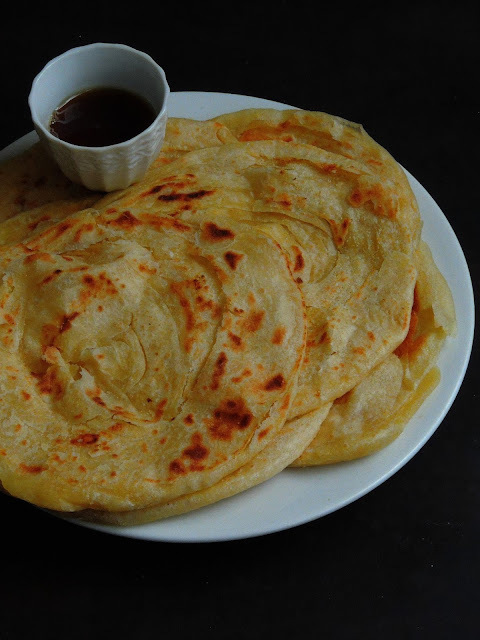 We (South Indians) are seriously unaware of this parathas until i get a chance to prepare this nutritious flatbreads at home. Last week, i have posted three different Moroccan dishes as i picked 'Moroccan Food' as theme for blogging marathon. 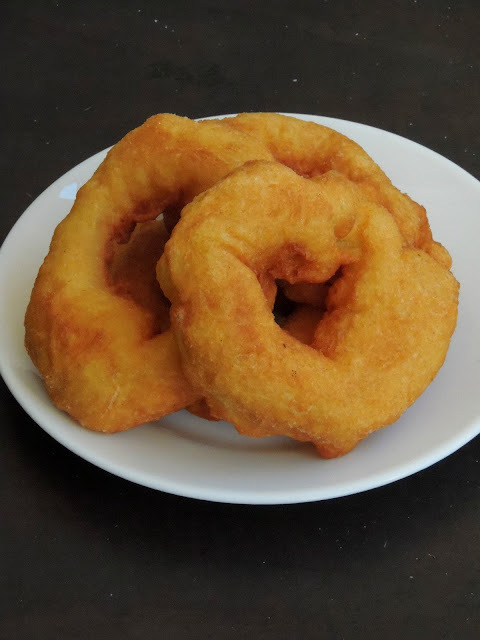 While i was searching for some different and interesting recipes from this cuisine, i got hooked to this Sfenj aka Crispy Moroccan donuts.Sfenj is also considered as Algerian Donuts, however you can start your day with this donuts and end with it. Sfenj is a popular street food of Morocco and Algeria, and they are eaten with a cup of tea or coffee as these donuts are not that much sweet. These donuts are crispy on outside with chewy inside. Poffertjes are festive holiday treat in Netherlands and they are quite popular at both summer festivals and Christmas markets. 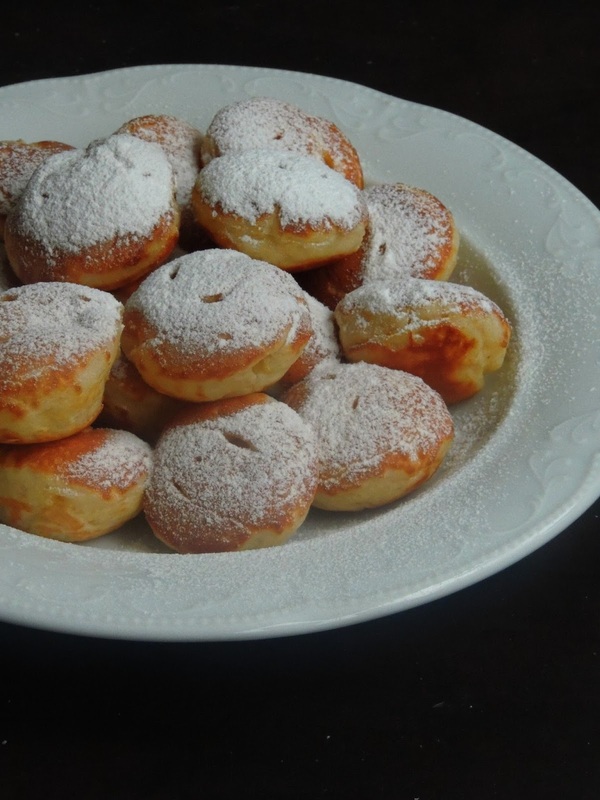 This Dutch pancakes are small,fluffy pancakes which are made with yeast and flour. Poffertjes ressembles as much as like our own South Indian paniyarams and Japanese Takoyaki though they differ in their ingredients. 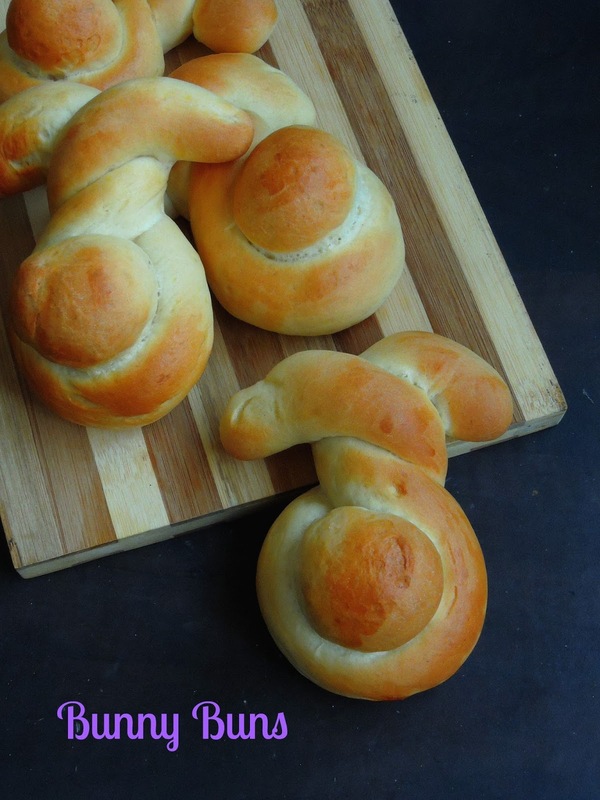 This classic Dutch treat calls for a special pan which have tiny indentations. Trust me these fluffy poffertjes are prefect choice for a sunday brunch. You can still serve them as a dessert topped with nutella or icecream eventhough the traditional way of serving this tiny pancakes is with melted butter and sieved powder sugar or else with strawberries and whipped cream. 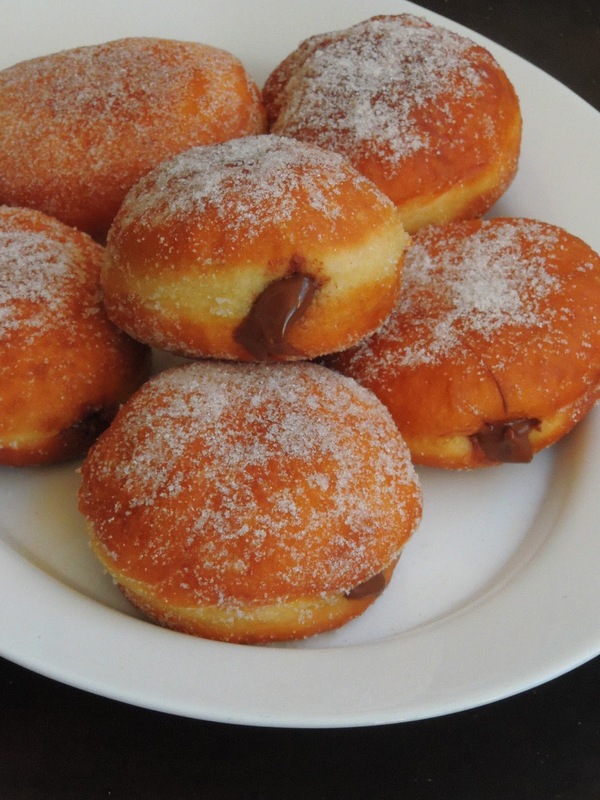 My kids are crazy fan of both Nutella and Donuts, they just love the store bought nutella filled donuts. Obviously they wont forget to grab a big bag of donuts from stores whenever they see them in stores. My younger one was requesting me since a long to make those nutelle donuts at home, i kept it in my to do list and finally i prepared these donuts at home few days back. Kids went crazy when i served this ultimate donuts for their snacks. Donuts are also well known street foods in many countries, though their name and shape may varies. Muesli, this dish is prepared basically with rolled oats, but fresh or dried fruits, seeds and nuts are also to make this breakfast dish more healthy. A complete meal to kick start a day when mixed with fruits juice, yogurt or else with cow's milk or vegan milk products. My kids are not big fans of this muesli. Obviously i dont forget to get muesli whenever i go to stores just to feed them by masking the 'muesli' with their favourite ingredients in it. One of my recent trial is this dangerously addictive muesli balls. 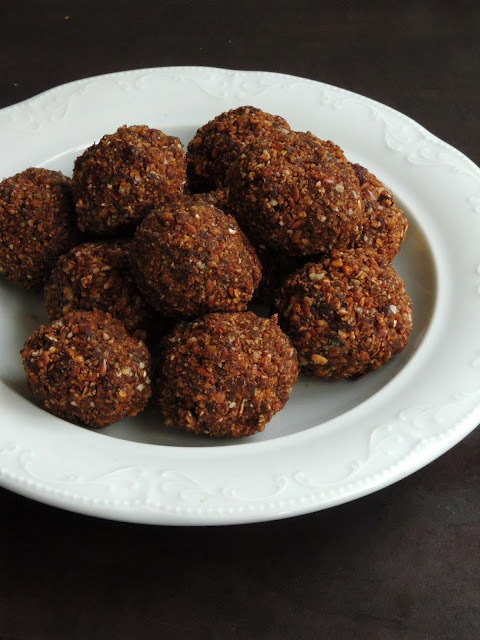 With honey and cocoa powder, trust me these healthy balls gets ready in less time than you can imagine. Savoury bread pudding, a prefect meal to kick start a day with less efforts. Mostly bread pudding are prepared as sweet version for desserts, but still savory bread pudding do exists. Yes savoury bread puddings can be eaten very much from a breakfast, lunch to dinner. 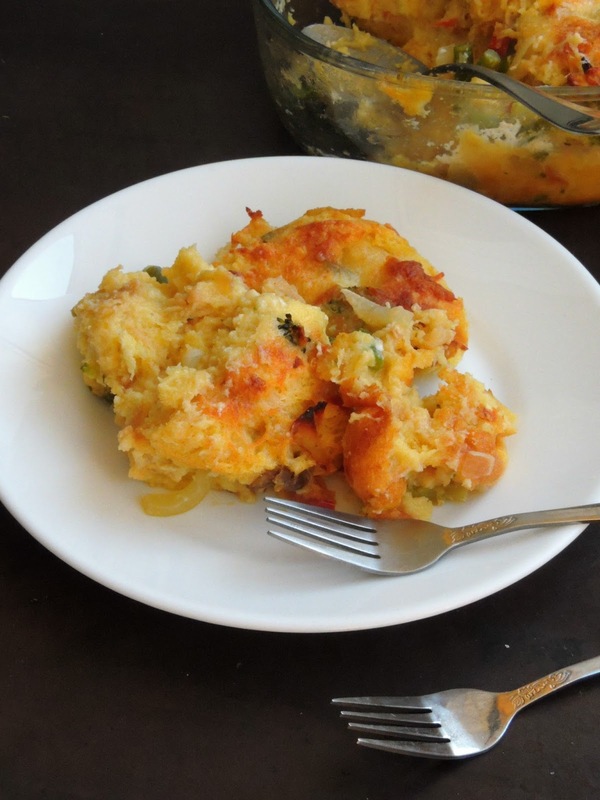 And its completely a comforting dish as this savory pudding is loaded with cheese and mixed vegetables. If you want to give a second life to your stale breads sitting in your bread loaf bag, then dont forget to check this ultimate savory pudding. 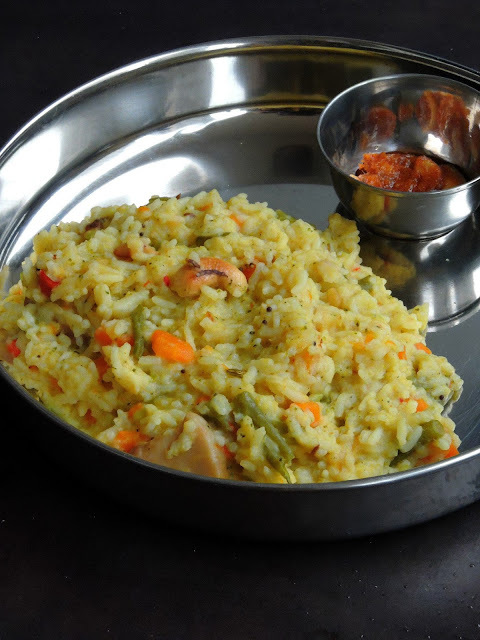 Simple to make my today's post is inspired from Harini's post, though i have posted already vegetable pongal, this post is different from my version. 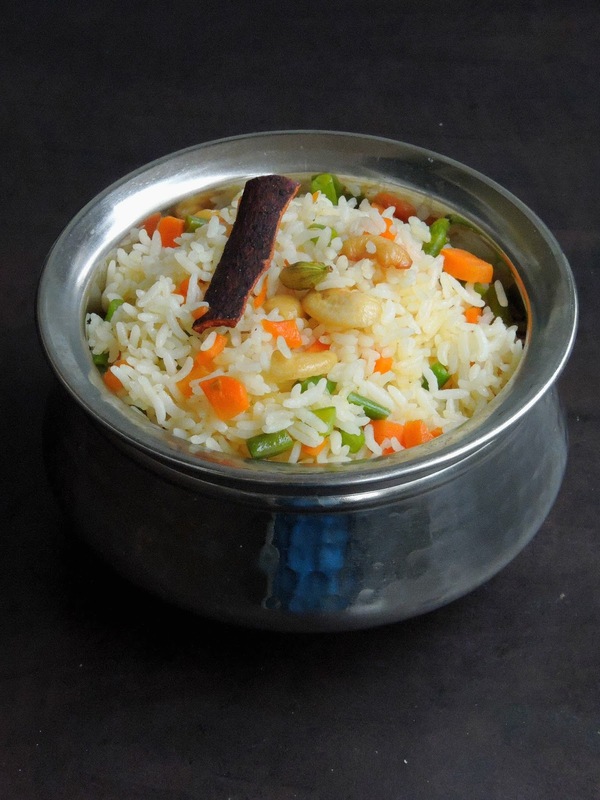 As much as like usual venpongal, this mixed vegetable pongal takes very less time and quick to prepare. 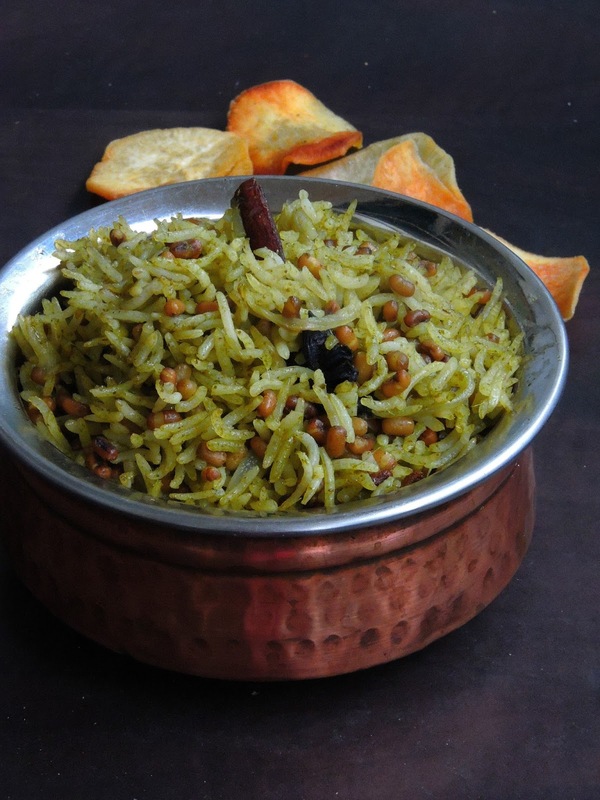 A complete, nutritious breakfast dish to enjoy with your favourite side dish or else with chutneys. Prepared quickly in pressure cooker, you can finish this fantastic dish easily with less efforts. 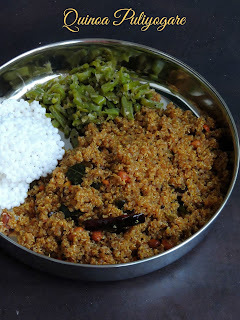 Definitely a comforting meal, we just enjoyed this pongal with spicy coconut chutney. Though i dont want to repeat often, i couldnt stop myself to say that i love baking breads at home, especially breads from different cuisine. Whenever i get a chance to cook from a different cuisine, i always look for a special breads from that particular cuisine. Am running this week's blogging marathon with 'Moroccan recipes' as theme, obviously i looked for a special bread from this cuisine. 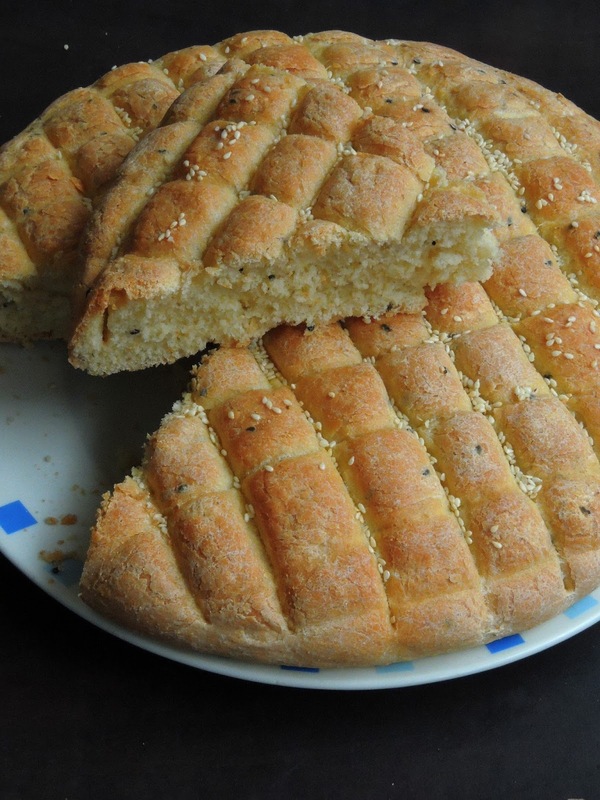 While googling, i crossed this Khobz Mzaweq, i immediately gathered all the ingredients and baked this incredible bread. 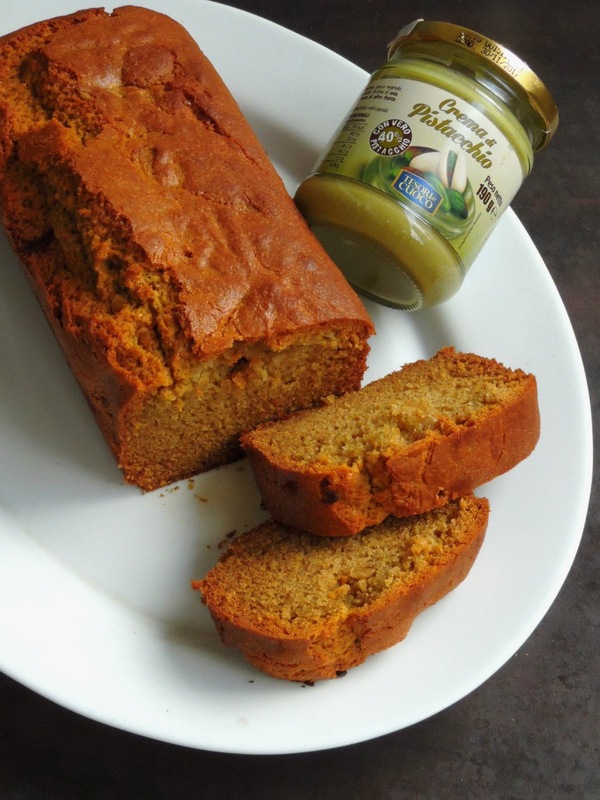 Though the original recipe used an egg in dough and an egg yolk to bring the shiny look to the bread, i skipped it completely as eggless and definitely as a vegan bread. 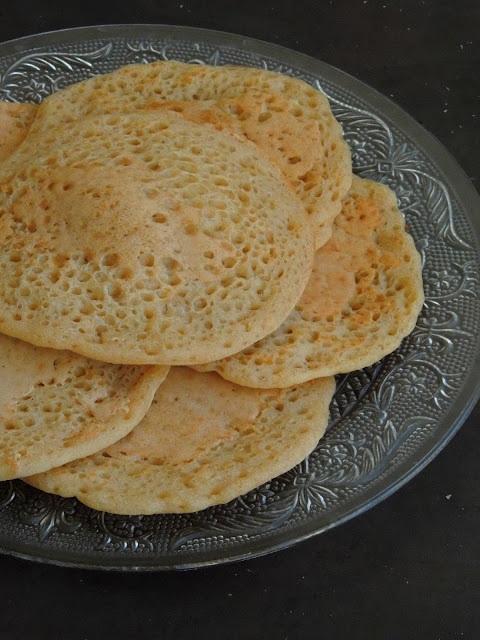 If you have tried already your hands with Baghrir aka Moroccan 1000holes pancakes, my today's recipe will definitely please you. 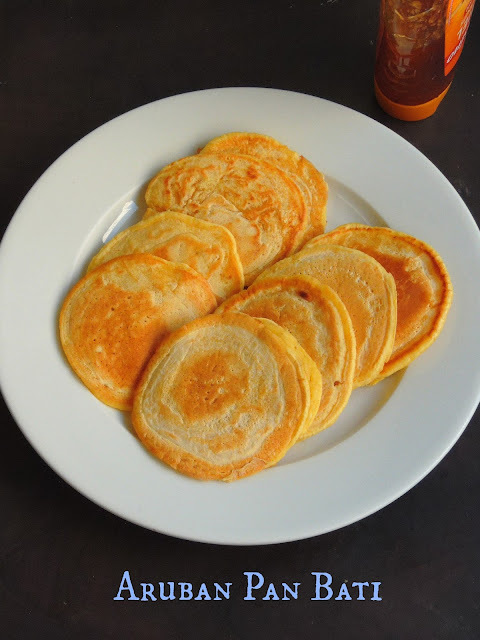 Baghrir, these pancakes are prepared either with all purpose flour or fine semolina, however the authentic one always goes for the finest semolina. The speciality of this pancakes is they are cooked only on one side,this gives the light,soft,spongy,tender texture with a beautiful honeycomb like appearance to this delicious pancakes. But Lemkhenfer is as much as like younger sister to Baghrir. Baghrir are cooked on one side, while Lemkhenfer is cooked on both sides.These pancakes can be made in large quantity and can be conserved in fridge, but dont reheat it in microwave oven or a toaster, just heat them in a hot pan and enjoy. Moroccan cuisine is typically a mix of Arabic, Andalusian, Berber and Mediterranean cuisines with a slight European and Subsaharan influence. And i love their cuisine very much, obviously if i get a chance to cook their dishes at home, i wont hesitate a second to prepare them at home. Am kick starting this week's blogging marathon with 'Moroccan Special' as theme. For the first day of this week's blogging marathon, i couldnt resist to prepare this super flaky round pancakes aka Meloui/Melwi.Moroccan Meloui is a flaky pancakes prepared prominently with fine semolina and all purpose flour with yeast. 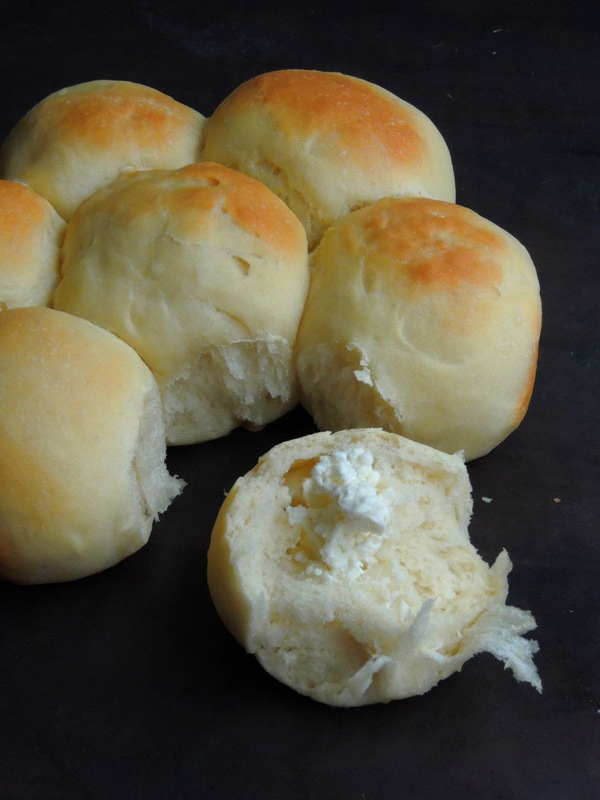 Once kneaded as dough and doubled in volume, this yeasted dough is flattened as much as thin. The meloui dough calls the rolling and layering as much as like South Indian parottas. After an eggless Pistachio pound cake and a gorgeous Marble pound cake, i couldnt stop myself to prepare a super rich pound cake with whipped cream. And this cake is neither eggfree nor butter free, not to forget that this pound cake also goes for whipped cream. 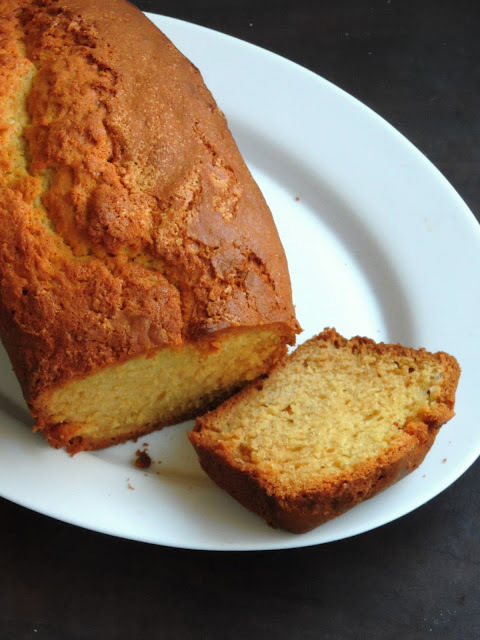 Obviously a rich pound cake to try and the texture of this cake will be super moist and dense And everyone at home enjoyed thoroughly this cake. Beating eggs with sugar for a long until they turns creamy makes the magic in this cake. Trust me, one cant stop just with a slice, yes this cake is dangerously addictive and believe me, a loaf of this pound cake gets vanished very much quickly than you can imagine. 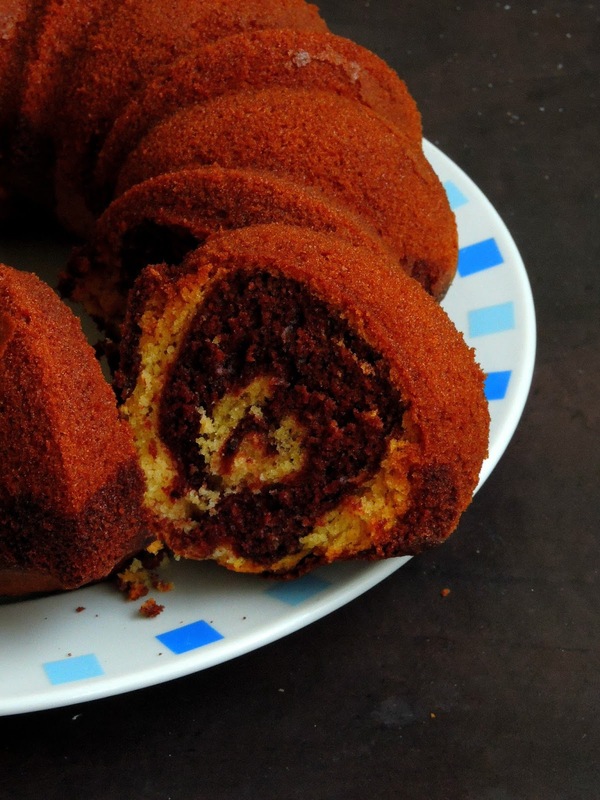 Most of the time, pound cakes are baked as loaves though bundt cake pan works awesome to bake some ultimate pound cake. 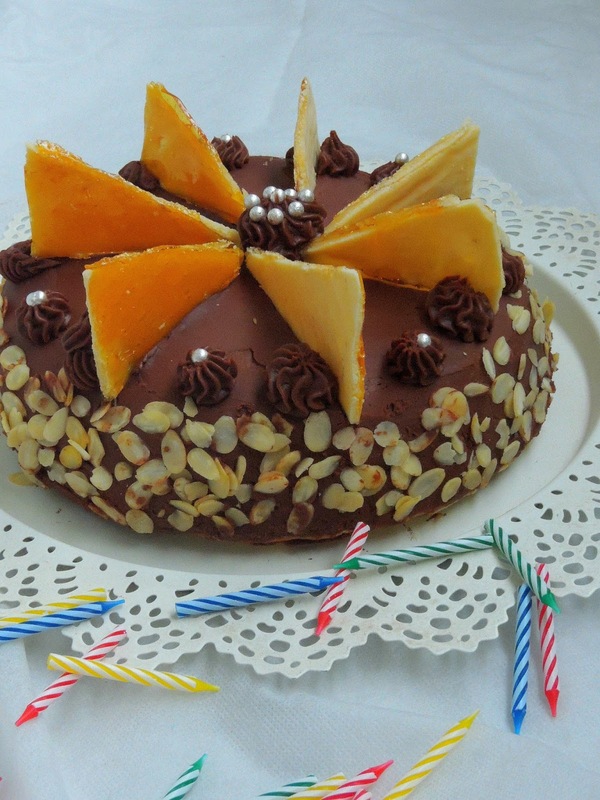 Pound cake is a super rich cake usually made with a pound of each of four ingredients: flour, butter,eggs and sugar. You can serve pound cake dusted with powdered sugar, lightly glazed or sometimes with a coat of icing. Wiki says that its believed that the pound cake have their origin from Northern Europe,which dates back to the early 1700's. 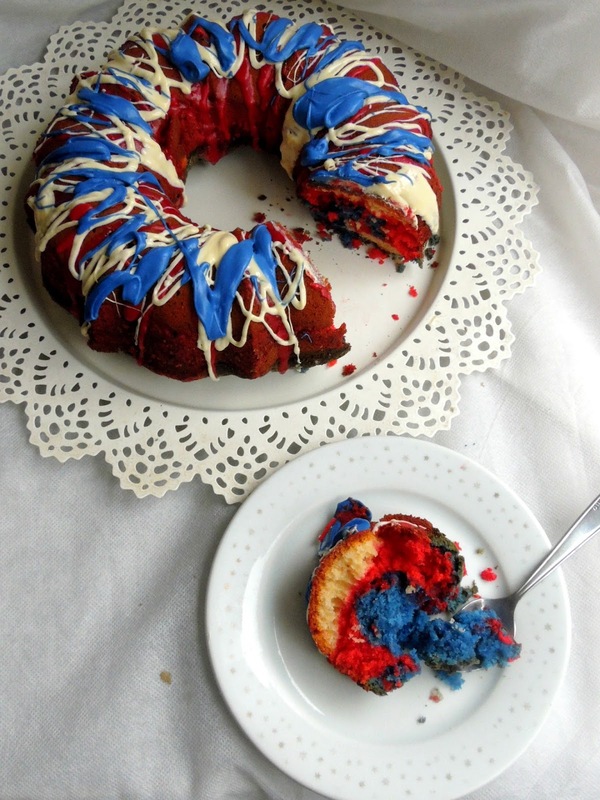 But a recipe for pound cake is in the first American cookbook which was published in 1796. In France, we call Pound cake as Quatre quarts which means four quarters. Seriously just with 4 ingredients, pound cakes are just prefect to enjoy during anytime of the day. I accidentally crossed Pistachio cream when we went last year to Sicily for our summer vacation, obviously i couldnt resist to grab few bottles of this cream. Back home, after sharing with friends and relatives, two bottles of those pistachio cream were sitting in my pantry. Hubby finished a bottle as spread for his breakfast over some grilled bread slices while the another bottle tempted me to try an eggless pound cake with. Without any hesitation, i baked this absolutely flavourful eggless pound cake with those pistachio cream. Actually this Sicilian pistachio cream is used as filling for cannoli, once mixed with smooth ricotta cheese, this cream makes excellent filling to fill a cannoli. However weather is not helping us much hence i couldnt think more than baking a cake with this pistachio cream than whipping some icecream with it. You may wonder to read the name of my today's post, yes Sweet Vegetable Pulao, this dish is from Assam cuisine. Actually, even i was surprised when i crossed this dish at Sunita's space, and this dish is really very easy to give a try. Though sugar is used in this one pot meal, they dont dominate much and we enjoyed thoroughly this incredible pulao with paneer masala. Every month,we are cooking from Regional cuisines of India for Shhh Cooking Secretly, a monthly event started by me, which is now hosted by Mayuri Patel. After Andhra Pradesh and Arunachal Pradesh, this month we are landing to Assam. Assam is a state of Northeast India, which is situated to south of the eastern Himalayas along the Brahamaputra and Barak river valleys. Assam is known very much for its tea and for their silk. Coming to their cuisine, an Assamese meal consists of rice, dal, fish curry along with meat curry or with a curry prepared with herbs and vegetables. Mug cake are seriously a life saver if you have some hungry tummies around you especially for snacks or else to please some sweet cravings after a meal. Mug cakes calls for microwave cooking, obviously these mug cakes gets ready very much quickly than the oven friendly cakes. Microwave mug cakes asks for either two or three minutes depending upon on your microwave oven's power consumption. Even my younger one prepare this sort of easy breezy mug cakes whenever he feels hungry especially after school for his evening snacks. After pumpkins, Apples are the popular fruits we can find easily once the Fall season starts. If you love tarts and crumbles for your desserts, then am sure you will definitely fell in love with my today's ultimate tart. Yes today's post is a delightful, utterly delicious apple and crumble tart. With a homemade crust and buttery crumble topping, whoever wish to have a fruity dessert after their meal will definitely enjoy this ultimate tart. 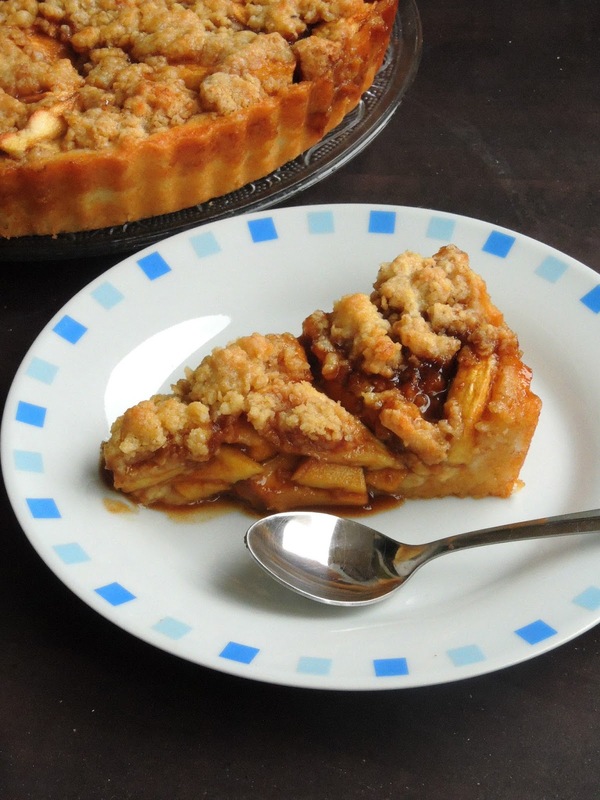 We just love tarts especially when prepared with loads of apple slices. Coated with brown sugar,nutmeg powder and cinnamon, those apple slices topped with crumble, once baked makes an irresistible tart to enjoy topped with fresh cream or else with a scoop of icecream. When i picked Crepes for all time as theme for running blogging marathon, i prepared some crepes with interesting twists. But however i kept few in my draft to post later.And my today's post was one among those crepes with interesting twists. 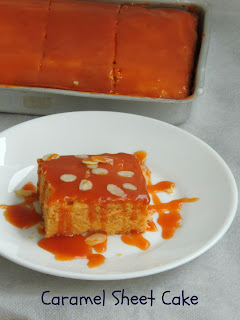 Am running this week's blogging marathon with Fall fruit desserts as theme. We get pumpkins abundantly while its fall season here. Once Pumpkin shows their head in our own farmer's market i dont forget to grab them as we love pumpkin very much in our soups and stews. 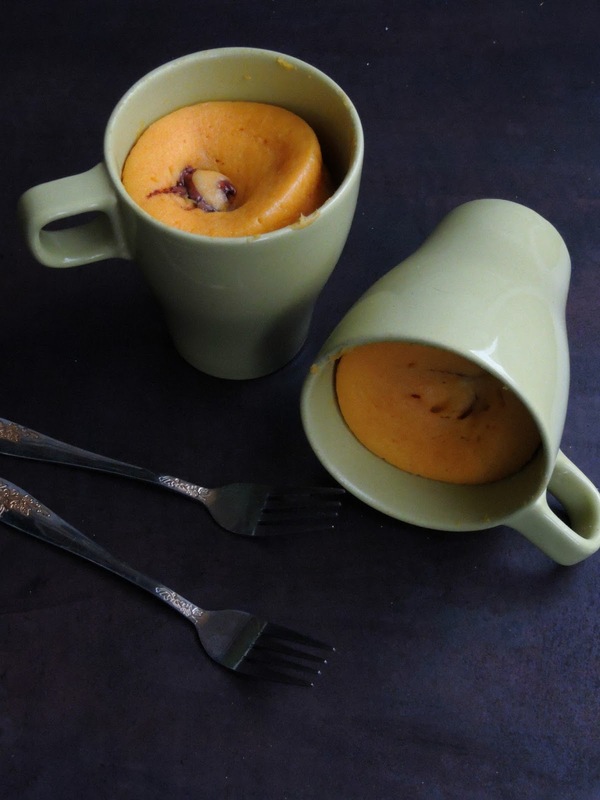 Pumpkin is definitely a versatile fruit and you can dish so many incredibles dishes out of it. Do you know pumpkin is a fruit though they are one among the popular squash you can find easily once Fall season starts here. 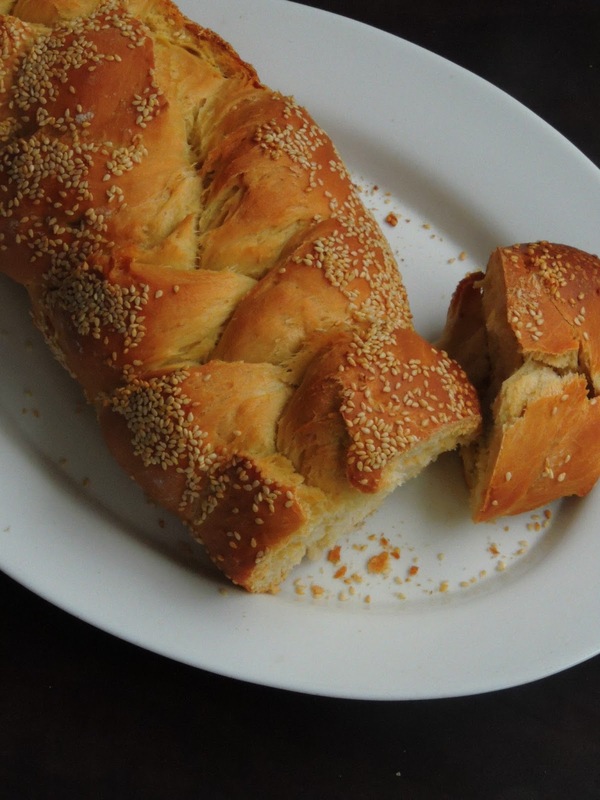 Scali Bread is an Italian style of bread which is long and somewhat flat loaf which is braided as much as like Challah. This bread have a soft crumb with a chewy brown crust. This bread is made predominantly in the Boston, Massachusetts area. It was originally made by the Scali family of Boston, and is now a regional specialty. This Boston's Italian-American Community bread aka this eggless braided bread is called a Scala if its a single loaf while the multiple loaves are called Scali. This bread is definitely a prefect bread for making sandwich with any sort of filling. No Italian meal in Boston is complete without a piece of this Scali bread. Dirty rice is a traditional Cajun and Creole dish made from white rice. This dish gets a "dirty" color from being cooked with small pieces of chicken liver or giblets, green bell pepper, celery, and onion which is spiced with cajun seasoning and black pepper. Dirty rice is one of the most popular rice dish in the Creole regions of southern Louisiana, eventhough you can find them in other regions of South America as well. 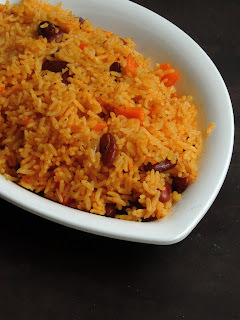 Dirty rice can be prepared as vegetarian and vegan version, just by replacing chicken liver or giblets with beans or with loads of varieties of vegetables. Vichyssoise, is a thick soup made of leeks, onions, potatoes, cream with vegetable stock or chicken stock. 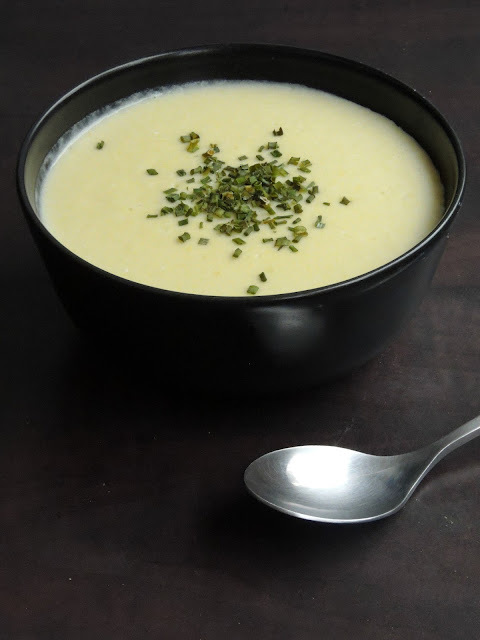 This creamy soup is traditionally served cooled though it can be eaten hot. Though this soup is well known in United States, the origin of this soup is still a big question mark, yes this soup is quite an American invention. Trust me, though this soup is a reinvention of a French chef who worked at Ritz Carlton in New york city, you can never find this soup in France. If you want to have this soup in France, you have no other option than making yourself at home. 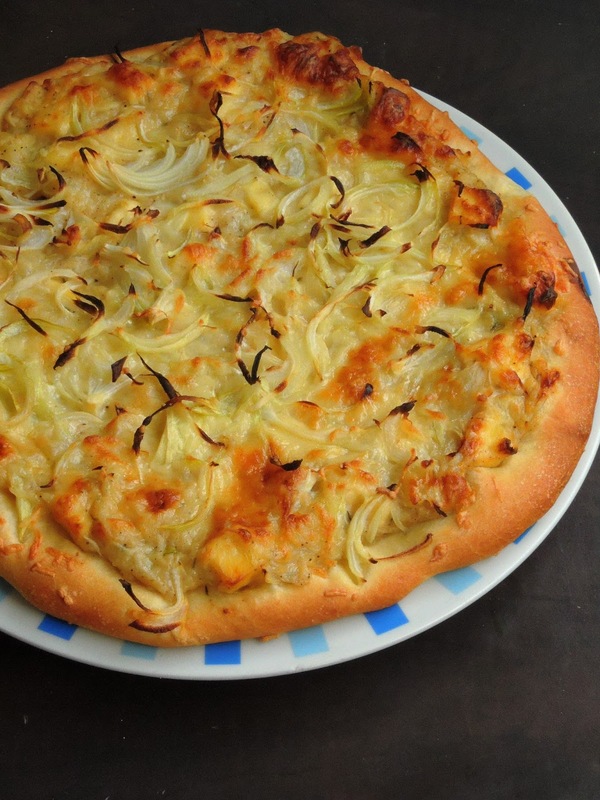 Fugazzeta, is a Argentinian pizza with loads of onions and mozzarella on a thick crust of pizza dough. Originally Fugazza comes from Northern Italy but the Argentine went on adding large amount of cheese. Obviously no tomato sauce or toppings are needed other than onions. Sliced onions simply flavored with oregano and olive oil is added to top of the Fugazzeta hence this pizza sounds as much as like Italian style focaccia. Coming to this Fugazzeta, its a double crust version of fugazza, a popular Argentinian treat aka onion pizza. This same fugazzeta can be prepared with a layer of sauteed spinach and vegetables, obviously its called as Fugazzeta de verdura. 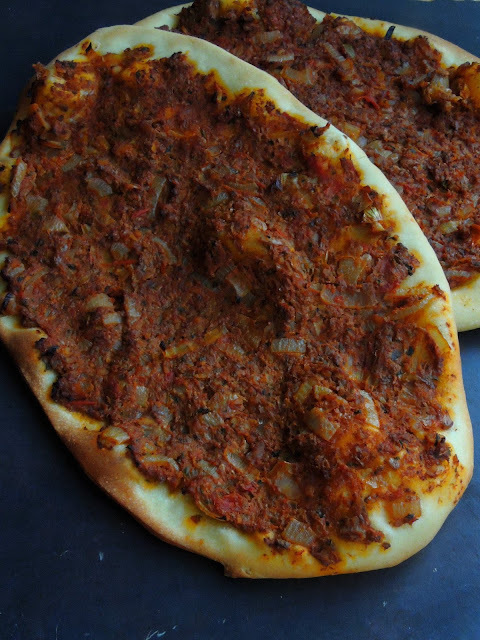 Lahmacun, this oval shaped Turkish pizza is traditionally baked with spicy lamb or minced beef topping. However Vegan and vegetarian versions do exists.As i told in my previous post, i baked three different and definitely delicious pizzas for this week's blogging marathon. My kids are ardent fan of pizzas, and obviously my kids went crazy once these homemade pizzas came out of the oven. Lahmacun, am trying my hands with this Turkish pizza for the first time and its completely vegan. 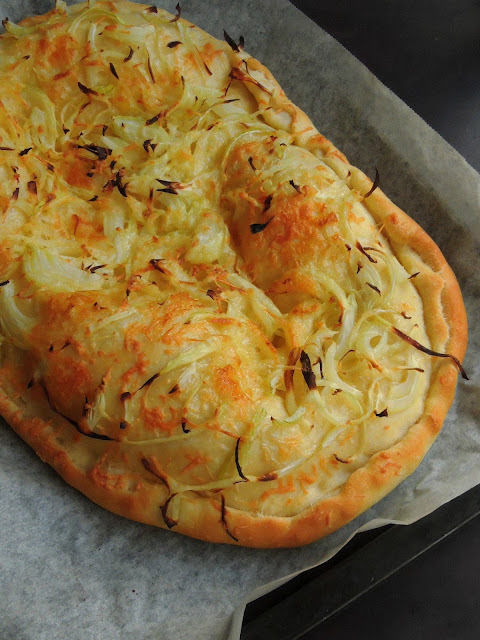 You may wonder how can we bake this Turkish pizza as vegan version, yes we can. Actually, in this vegan pizza, those spicy lamb or minced beef topping is replaced with a mushroom and walnut topping. 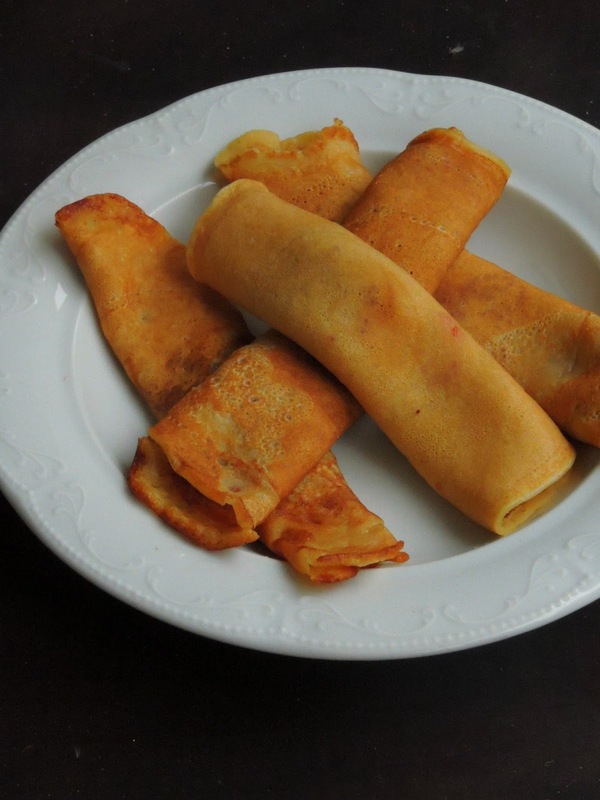 Nalesniki, are thin or thick crepes filled with various fillings like fruits, cheese or else with savory fillings. Though some sites call this Nalesniki as Pancakes, personally i felt that they are bigger in size than the pancakes, hence for me they are crepes. When filled with a cottage cheese filling, these Polish crepes are called Polish Blintzes or filled crepes. However this Polish crepes are very easy to learn though cooking them need some practice. I have been looking for a different crepes and i got hooked to this Polish crepes especially those crepes prepared with the savory filling. However my family members doesnt like savory filling, hence i went with sweet filling. Do you know those traditional cream cheese filled Polish crepes, once filled and rolled, they can be baked,pan fried or dipped in beaten egg and bread crumbs and fried as much as like rolls. Dosa or idlies are popular South Indian breakfast especially in Tamil nadu, obviously you may cross numerous varieties of South Indian crepes aka dosas in this virtual world. If i forget to grind usual rice-urad dal idly batter,obviously my mind will go either for non fermentation dosa batters or else for mixed grains dosa batter. Sometimes i mix and match the ingredients,needless to say my space have a variety of dosas. 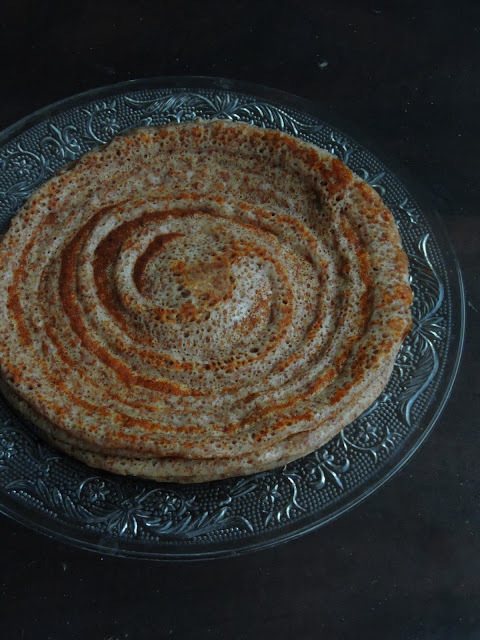 My today's post is one of my recent trial with handful varieties of grains, yes this dosa batter have grains like fingermillet, pearl millet,little millet, barnyard millet,barley, quinoa, kodomillet,brown rice and oats in it. Extremely wholesome and nutritious, these dosas are definitely prefect to kick start your day with. This week's posts are going to be Crepes, yes i picked Crepes for all time as theme for this week's blogging marathon. 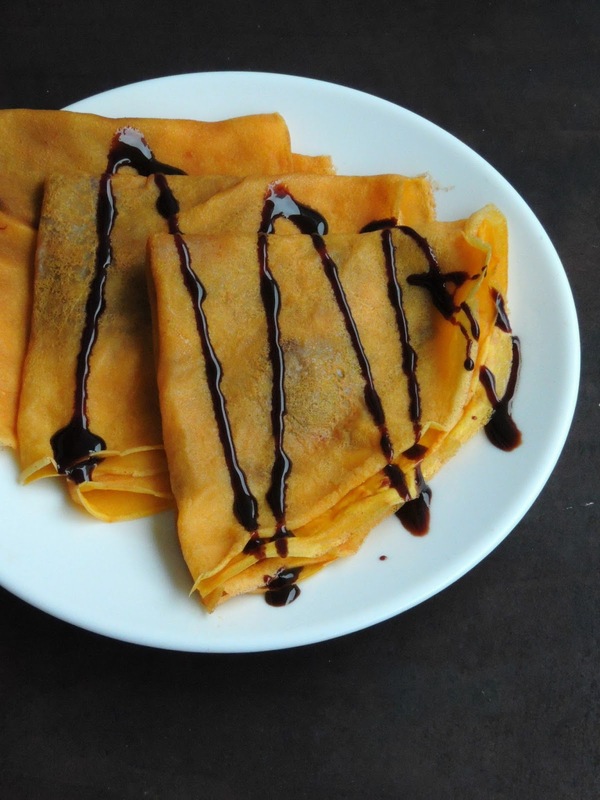 Crepes, these thin pastry are usually made with flour and eggs, however many versions do exists either by making with buckwheat flour (as galettes in French) or else flavored by spices or fruit peels. My today's post is a Spanish style crepes which is called Frisuelos and this crepes have their origin from Austrias and Leon, the northern regions of Spain. 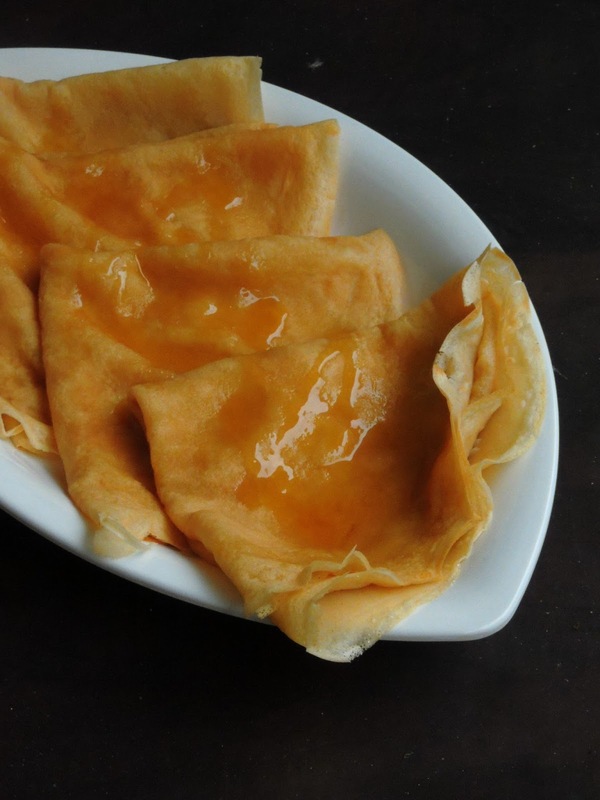 This crepes is a typical Spanish crepes which is flavored with lemon rinds and alcohol like cognac, rum or brandy. Arunachal Pradesh is in Northeastern part of India and its known for its tribal community. Obviously their food consists mainly of non vegetarian foods. 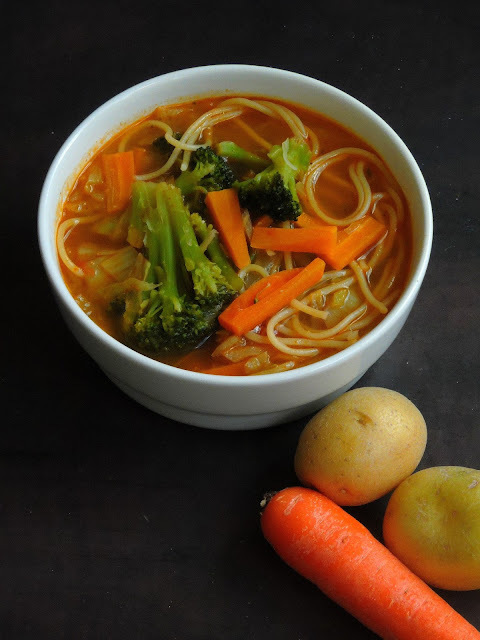 However my today's post is a vegetable soup which is called Thukpa, actually Thukpa is a Tibetan noodle soup which have its origins in eastern part of Tibet . But this dish is quite popular in Nepal, Bhutan and in states like Sikkim, Assam and Arunachal Pradesh in Northeast India. Usually prepared with meats, you can still prepare this quite filling soup as vegetarian version just by skipping the meat part. Loaded with various vegetables and noodles, one can finish their lunch or dinner happily with a bowl of thukpa. And this post goes to this month's Shhh Cooking Secretly event started by me, which is now hosted by Mayuri Patel. When i was searching something new to cook from Caribbean cuisine, i landed to this blog and i got hooked to this fantastic potato pie. 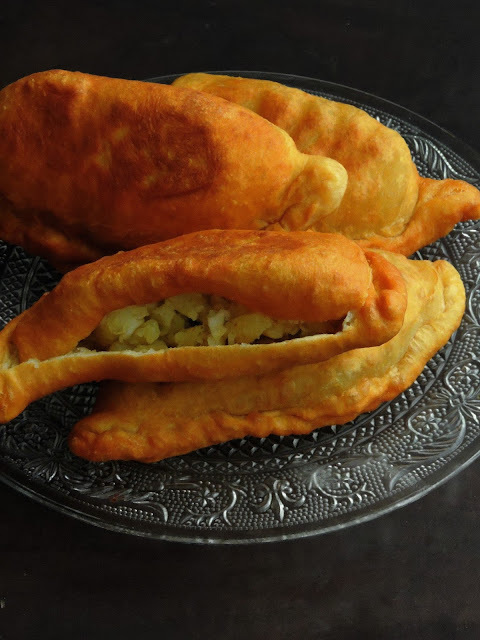 Though Doubles, an another Trini dish prepared with spiced chickpeas and flatbread as sandwiches are well known as street foods in Trinidad, these potato pies are also sold as another popular street food. Sold as street snack food, these potato pie have their own place in street vendors cart. Stuffed with boiled potatoes flavored with culantro leaves, cumin, chopped onions, these aloo pie are ready to munch with your favourite drink. One can finish even their lunch or dinner with two aloo pie, yes they are quite filling and delicious as well. In most of the restaurants in Trinidad, this aloo pie is filled with spiced chickpeas as per your request or else served along with mango or tamarind chutney. Wikipedia says that 'Bokit is a Guadeloupean sandwich fried in a saucepan with hot sunflower oil'. It is essentially composed of flour, water, salt and bicarbonate or yeast.This typical Guadeloupean food started to develop in the mid-19th century after the abolition of slavery. At this time, the poorest workers could not even buy some of the basic products such as bread. As they were good observers, they had the idea to adapt and produce a bread by themselves, without yeast at this time, and cooked in a saucepan with hot oil that they used to call "kettle bread" because of the vapor going out of it. Bokit was inspired by the "johnny cake" which is a kind of fried bread that the New England colonies may have borrowed from the Indians. 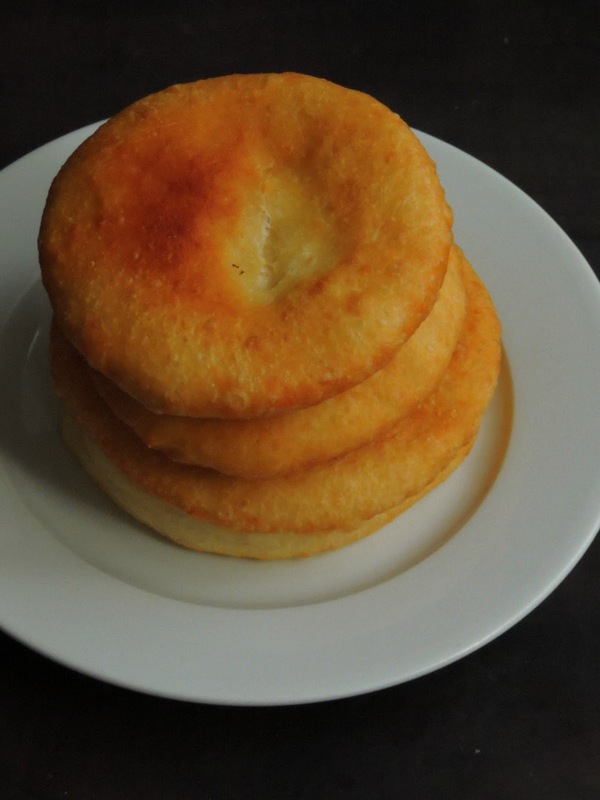 Over the exchanges between the Caribbean colonies during the 18th century, this fried bread became the djoncake in Dominica and Barbados. 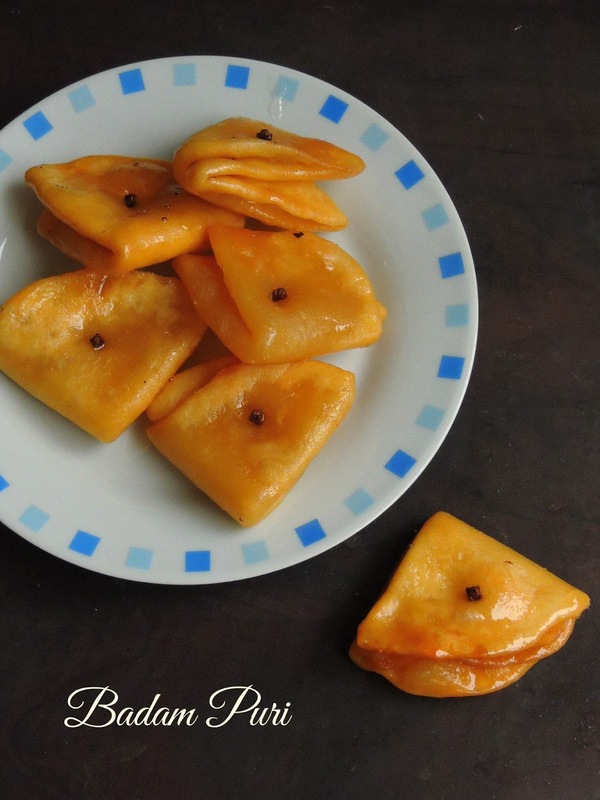 People on French island heard djonkit or dannkit, it has been given the final name of "Bokit" in Guadeloupe, and has become a typical Guadeloupean speciality. Aruba is one of the Lesser Antilles islands located in the Southern Caribbean Sea. The island is located miles off the coast of Venezuela and on clear days it is possible to see Venezuela from the south-eastern side of the island.The Lesser Antilles are several islands extending in an arc from Puerto Rico to the north-eastern coast of South America. Some of the islands that are part of the Lesser Antilles are the Virgin Islands, Saint Martin, Guadeloupe, Grenada, Barbados, Trinidad and Tobago, Curacao and Bonaire. You may wonder why am talking about this Antilles islands, yes we are going to surf through Caribbean cuisine. Am running this week's blogging marathon with this interesting theme. Today am taking you all virtually to Aruba with this Pan Bati. After two no pasta/noodle free Lasagna , i couldnt resist to prepare my kids favourite lasagna with lasagna pasta. Actually am running this week's blogging marathon with Lasagna for Veggie lover, obviously vegetarians will enjoy thoroughly this vegetarian version of lasagna. My today's post is loaded with mushroom and spinach. I used buttom mushrooms and fresh spinach for the filling with white sauce and cheese. Easy to make, this lasagna makes an excellent meal as this ultimate dish is definitely a satisfying dish for anyone. Whoever like Lasagna will definitely enjoy this mushroom and spinach loaded lasagna. Potatoes, mash them, fry them, make them as chips, or else drop them in gravies or curries, we can have it as much as can. Potatoes and chocolates are our family favourite, obviously when i picked Lasagna for veggie lovers as theme for this week's blogging marathon, i planned immediately a gluten free potato lasagna for this week's theme. 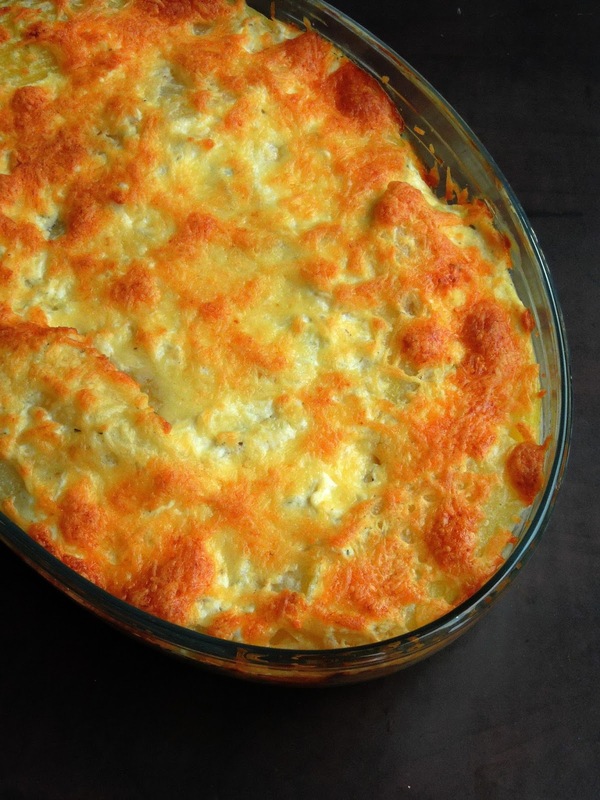 Potato lovers will definitely go crazy if they see this ultimate pasta free potato lasagna. An excellent meal to enjoy for your lunch as well as for your dinner. Though potatoes are easy to cook with, this lasagna takes very less time as well than you can imagine. Coming to this potato lasagna, i went for white sauce aka bechamel sauce, ricotta cheese with Swiss cheese and parmesan cheese for making this ultimate dish. 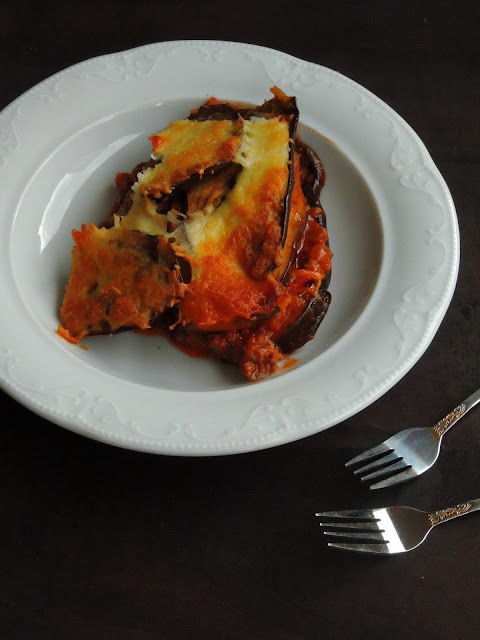 My today's post calls for an easy version of Eggplant Lasagna which is completely gluten free but not vegan as i cant imagine Lasagna without cheese. Am happy to say that i prepared this fantastic Eggplant Lasagna with an interesting filling with minced soya and tomato sauce. You may wonder why am talking about Lasagna, yes my theme for this week's blogging marathon is Lasagna for Veggie Lover. 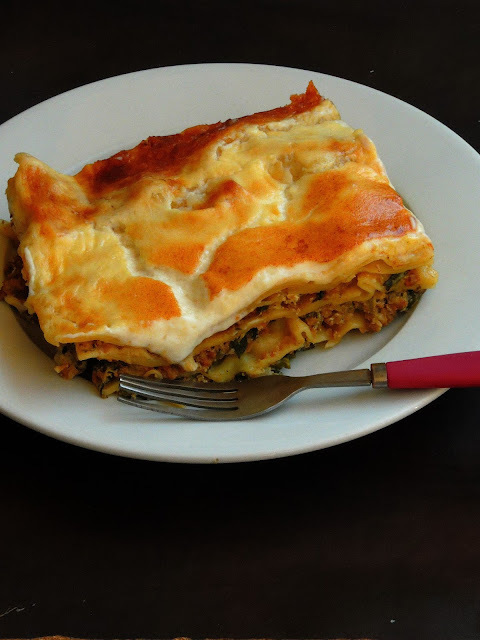 Obviously my today's post is definitely a no noodle lasagna and trust me this lasagna is very flavourful and a prefect dish to whip up if you are following a gluten free diet or a low carb diet. You dont even miss the noodles here and this gluten free eggplant lasagna will definitely please anyone's hungry tummy. A prefect dish to relish either for your dinner or for your lunch with your favourite meat or salad. Deepavali/Diwali is around the corner, obviously am sure you guys will be busy in preparing or listing for Diwali sweets or savouries. Have you ever tried murukkus aka this deep fried Diwali savouries with Palak aka spinach greens. Adding greens to the usual murukku will definitely make the simple murukku as a greenish murukku. 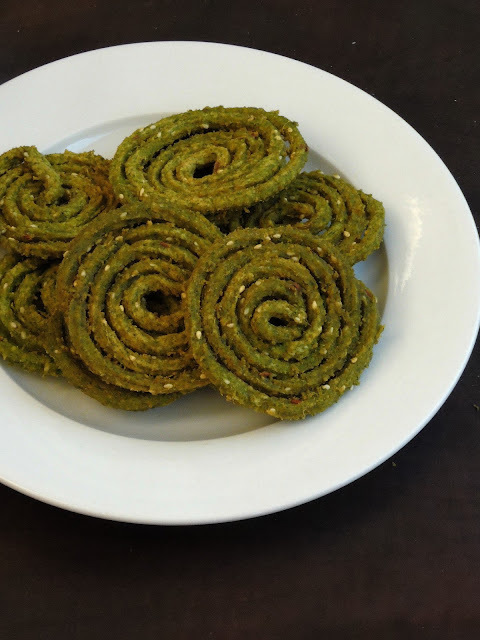 Kids will enjoy munching this greenish murukku and i must say honestly that they were attracted by the colour of this chakli. And needless to say that this murukkus aka green deep fried beauties are loaded with spinach, obviously eventhough they are deepfried they are still healthy for kids. 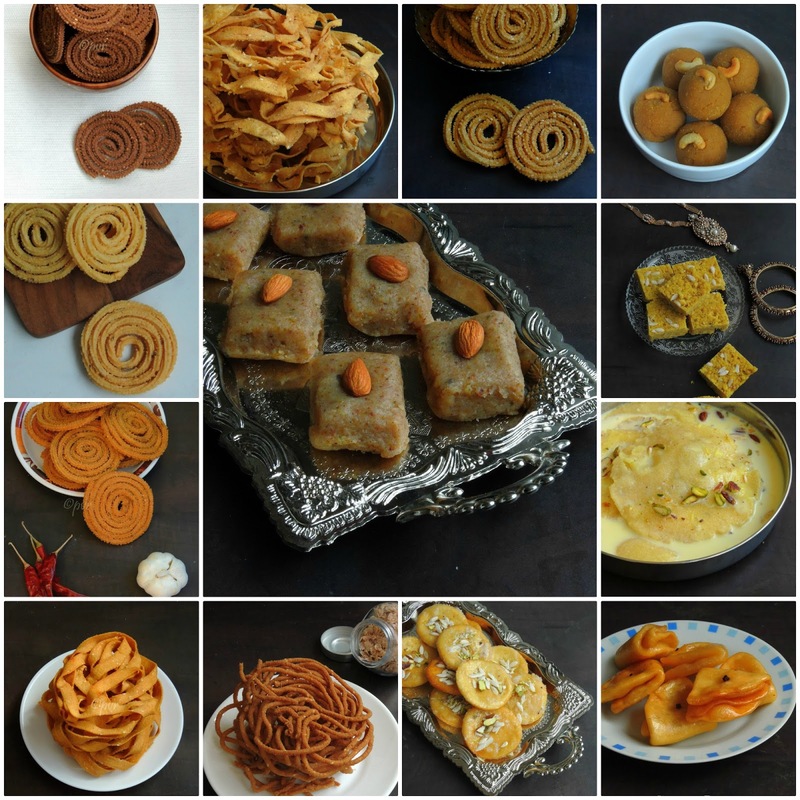 Diwali is around the corner, i couldnt resist to share 30 Sweets and Savouries you should prepare at home. Get ready and cook your favourite sweets and savouries for Diwali from my collection of Diwali special dishes..Some are my own creations while some are from traditional dishes. Barnyard millet, is definitely a super versatile grain you can cook up many delicious dishes from breakfast to snack foods. I have been cooking with millets often as i love to feed my family members with healthy grains in their diet. Millets replace very well rice or other grains in your diet. 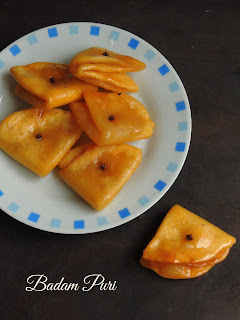 And when its comes to cook some savouries with those incredible millets, i dont hesitate a second to dish some interesting snack foods aka savouries with them. Not to forget that millets works awesome to make sweets as well. Hope you guys are busy in searching for some interesting sweets and savouries for Diwali, just 9 more days to go and once again i miss celebrating this fantastic festival of lights at my hometown. However its again a working day for us, seriously we are going to miss the fun here. If you are bored of preparing badam halwa, kaju katli or else coconut burfi for the upcoming Diwali festival, check my today's post. 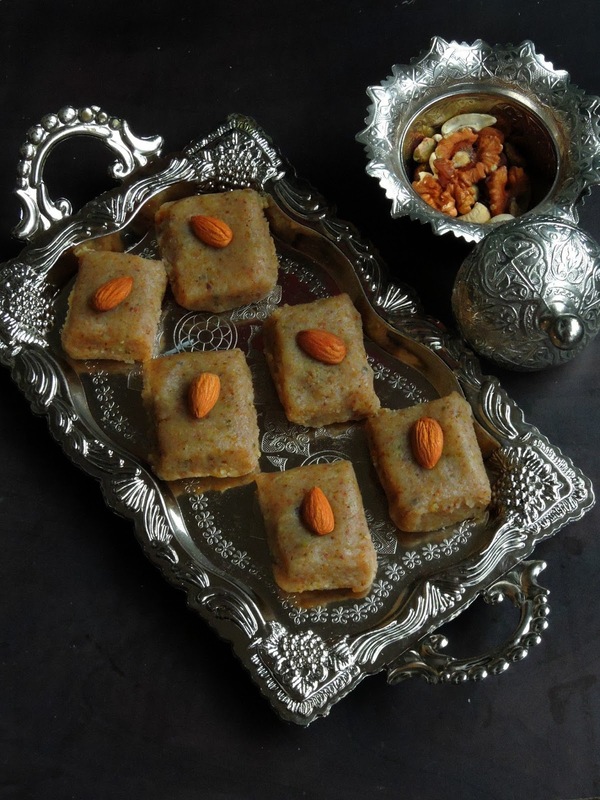 Mewa burfi is prepared with a combination of different nuts and coconut flakes. Mewa means Mixed nuts in Hindi and not to get confused with Mawa or Khoya the popular dairy product used in making many delicious Indian sweets. I crossed this Ultimate Mewa burfi while googling for a different Diwali special sweets. And the best part of this burfi is you can use any sort of nuts you have on your hand. Ricotta cheese plays an important role to whisk up this sweet quickly. Obviously if you want to prepare this nuts burfi with unsweetened khoya, just go on. 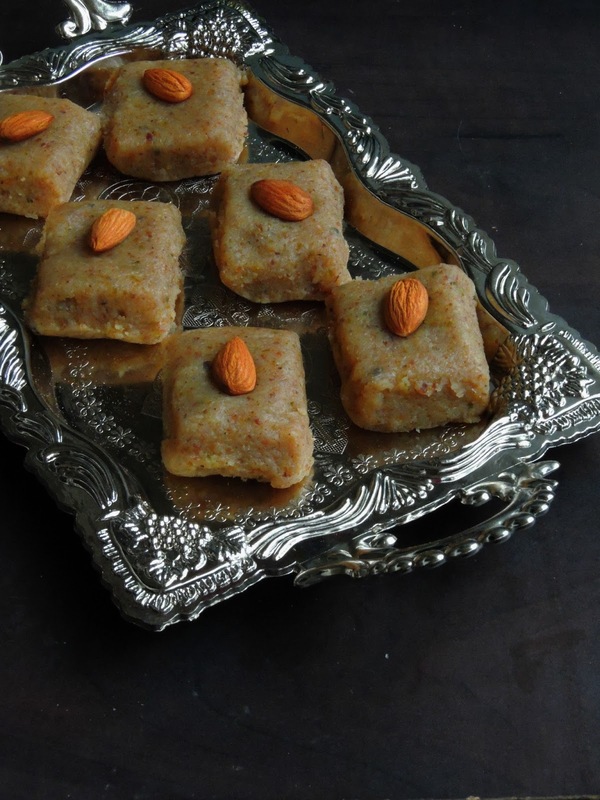 And trust me, this burfi is definitely an easy breezy sweet to prepare especially for festivals or for a special occasion. 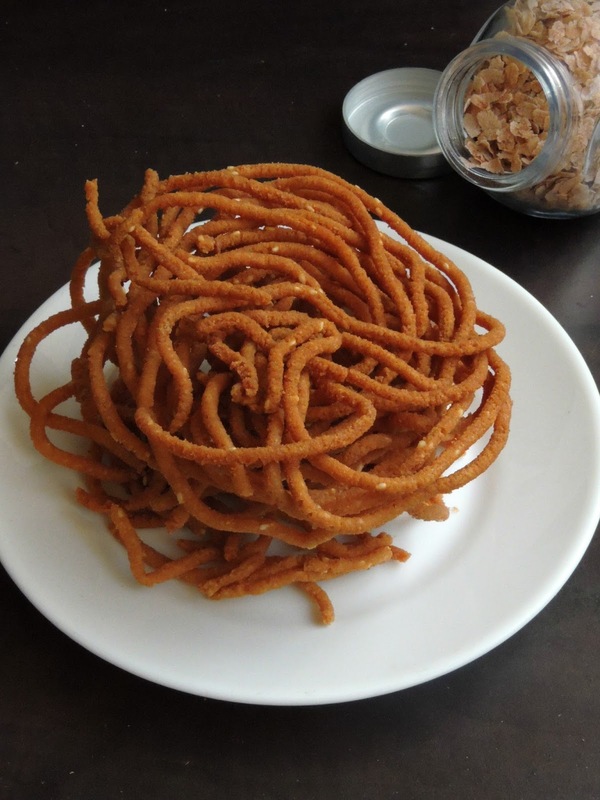 Have you ever tried making out Chaklis aka some crispy murukkus with rice flakes, if not you should try atleast once as they are extremely crispy and dangerously addictive. 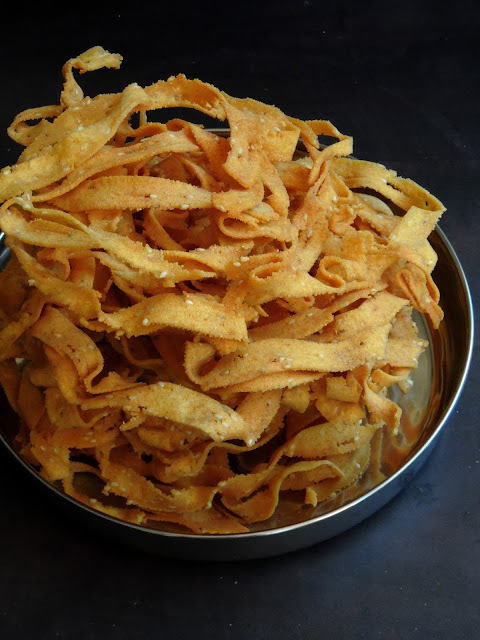 Red rice flakes when grounded as fine powder and sieved, they are just ready to prepare your murukku dough with other ingrédients like gram flour, butter, sesame seeds and asafoetida powder. Grounded and sieved red rice flakes once mixed with other ingrédients makes this incredible crispy munchies. Actually red rice flakes grounded as flour replace very well the humble rice flour we usually use for making the murukku dough. Today's cookies are melt in mouth cookies which are quite hard to resist. These ultimate cookies are extremely buttery and easy to make. 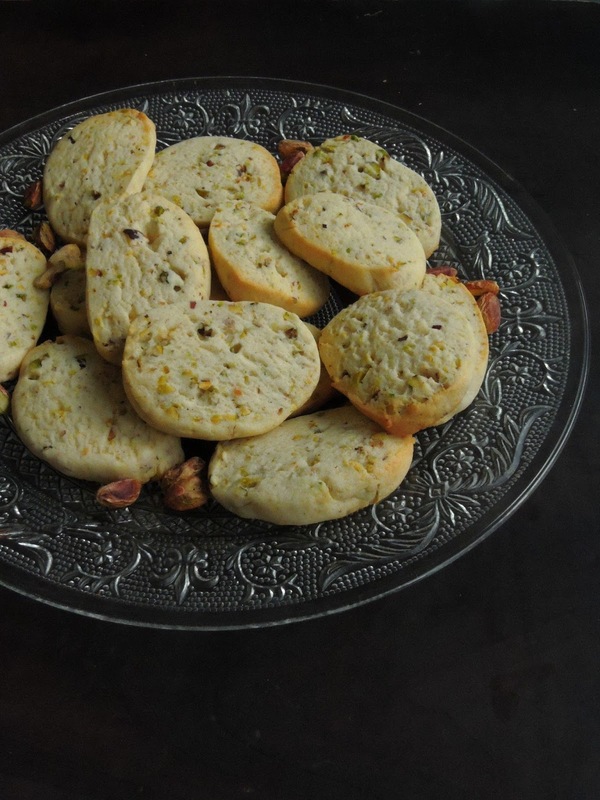 With easy ingredients, these cookies are slice and bake cookies which is simply prepared with small bites of pistachios in it. Obviously you can prepare this fantastic slice and bake cookie dough earlier a day, and they are just ready to slice and bake as much as you want or whenever you feel like baking. Needless to say that this sort of slice and bake cookies are very convenient to bake and super tasty to munch with your favourite drinks. The cookies are fabulous and very tender, with a nice crispness to them. If you prefer your cookies a little crunchier, you can simply leave them in the oven for a few extra minutes.